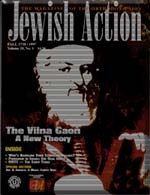 The Jewish Action articles can be viewed using the Adobe Acrobat Reader. If you do not have this software, it can be downloaded FREE. Chinuch: Is It Really Working? Religious Zionism - What's Next? The index for this issue is here! Symposium: "You Have Chosen Us From Amongst The Nations"
What Does Halachah Say About Organ Donation? When was the Second Temple Really Destroyed? Special Section: Is the Temple Mount Still Ours? Revising or Devising Israel's History? "Behind the Headlines in YESHA"
Is Religious Zionism in Crisis? The Anthropic Principle - What is it and Why is it Meaningful to the Believing Jew? · Mandell I. Ganchrow, M.D. Rabbi Abraham J. Twerski M.D.